In 2016 I released the Small Spells tarot deck, after spending a year and a half immersing myself in the cards. Each of the 78 cards has an original illustration, drawing on traditional meanings, but also my own intuited interpretation and symbology. The deck comes with a guidebook, providing insight into how to give readings, how to access intuition, and how the tarot can act as a healing tool for everyone. The meaning of each card is discussed in accessible language. 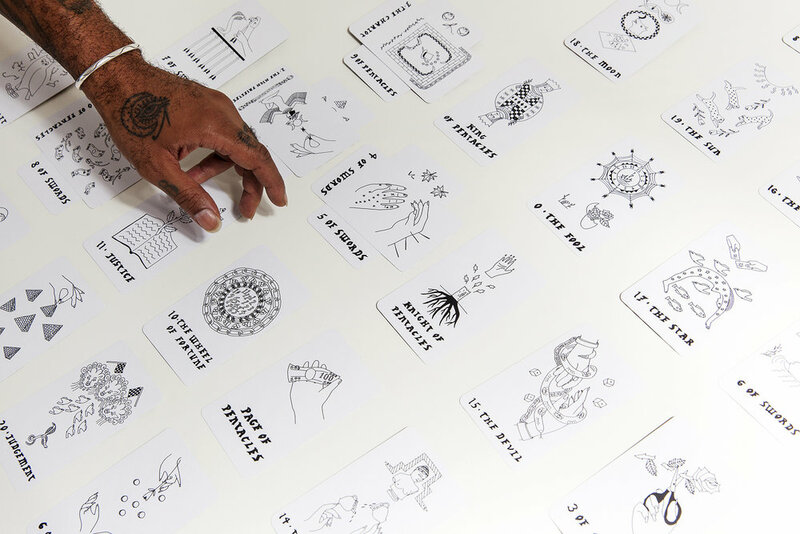 The original deck is in minimal black and white, and a color version was launched in early 2018. The illustrations in both versions are the same, but the addition of color lends a different vibe. After using the Rider-Waite deck for years, I felt that an updated take on the classic imagery would be welcome, as tarot continues to grow in popularity. At the same time, my drawing practice began to take on more symbolic meaning, and my interest in using visual imagery to communicate feelings and energy was growing. It all came together in the creation of the tarot deck. The images for each card were carefully channeled and drawn, in tune with the meanings of each card.